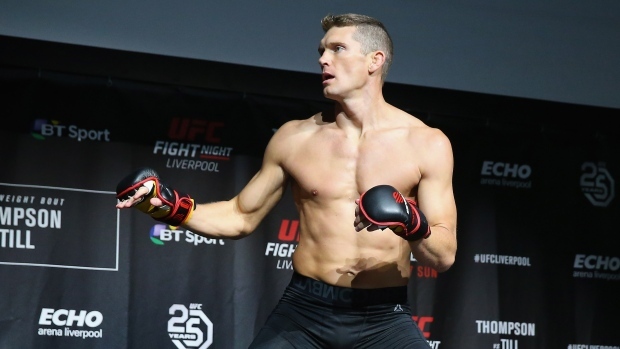 Since making his debut in the UFC more than six years ago, Stephen “Wonderboy” Thompson has climbed the ranks of the welterweight division. Utilizing an unorthodox karate style and with a combined fifteen amateur and professional kickboxing championships, Thompson took the UFC by storm with some vicious knockouts, becoming a must-watch fighter in the process. Now, at age 35 and following two failed championship attempts in back-to-back fights against Tyron Woodley that resulted in a draw followed by a razor-thin majority decision loss that UFC President Dana White felt that he had won, Thompson remains the top-ranked contender in the division. However, several new challengers have emerged in the division, including Colby Covington, Kamaru Usman and Thompson’s opponent this weekend Liverpudlian Darren Till, who he faces in the main event of Sunday’s UFC Fight Night event in Liverpool. Till will undoubtedly be the crowd favourite in a city with as passionate a sporting fanbase as anywhere, but Thompson has been well received since his arrival. The fight with Till has long been coveted by fans since it was initially reported as a possibility, but Thompson was hesitant to take the fight. Thompson has never lost to a younger opponent and does not plan to start now. “I think Darren Till is very durable, he’s a very young fighter, most of the guys I’ve fought have been my age other than Rory MacDonald. He’s a very hungry fighter and he’s doing it in his hometown. His striking is very good, he’s definitely a big guy, a big welterweight and he’s put some guys away, so you have to look out for that left hand,” said Thompson regarding how Till stacks up to the previous opponents on his impressive resume.